The following article is contributed by Ryan T. Smith and Wendy Rein, Artistic Directors of RAWdance. YBG Festival has commissioned RAWdance to create and perform the upcoming site-specific dance program Through my fingers to the deep. We asked Ryan and Wendy to tell us about the starting points and decisions made in the creative process, as well as how to take in a site-specific work. 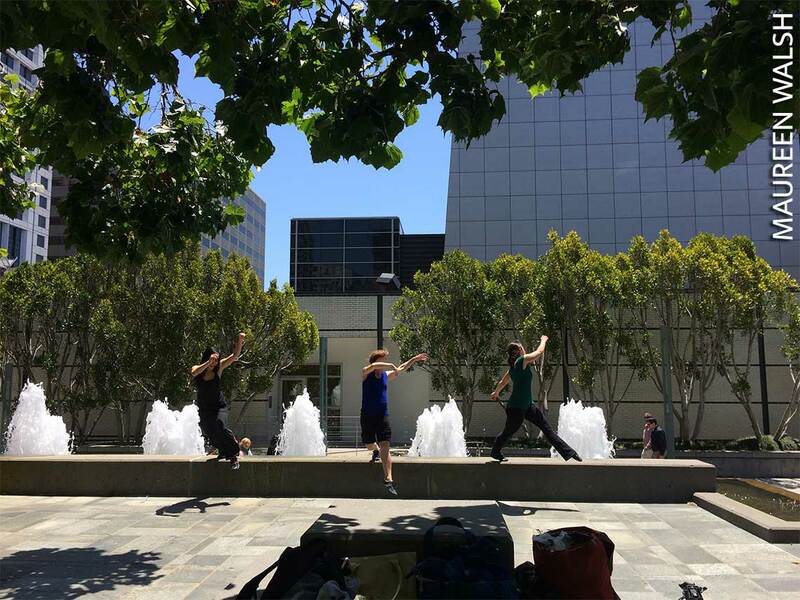 We’ve spent many, many hours in Yerba Buena Gardens over the years, but when we were invited to make a site-specific piece there, we set out to roam through the space with fresh eyes. There are an abundance of cozy nooks, even more architectural pedestals, and a handful of mini-forests. We found spaces that we’d never noticed before and came across many that we use regularly without giving them a second thought. The more we wandered, the more we began to realize that we wanted to highlight these differences in our piece. How do we take in the space around us? How do our senses shift in each site? How do the planes, textures, and sounds affect what we create, and what we see? We’d love our audience to absorb the Gardens with a new perspective. Through my fingers to the deep takes the audience on a journey through the park. They will start all together on the main green, and then be split into three groups. Each group has a guide who will lead them in turn to three various main performance sites (with some short stops along the way). The audience groups will all see the dances performed in a different order, finding their own threads and connections as they go. We tried to soak up as much information about the Gardens as we could for the making of this piece, including the details of its physical structure. In one of our first conversations, our set designer, Sean Riley, told us about the park’s underpinnings — the layers of concrete, rubber, styrofoam, and even the North Wing of the Moscone Center, all sitting beneath the grass. We were fascinated by the almost contradictory idea of constructing something that seems so natural. We were also intrigued by the complex history of the Yerba Buena district, a multi-decade effort to create a diverse, cultural center that was met with both acclaim and conflict. While working on this piece, we’ve had an acute awareness that San Francisco is again in a time of flux, with intense competition between arts spaces, corporations, residents, and open spaces, all being renegotiated and repurposed at an incredible rate. With the ground beneath us quite literally shifting, this project has led us down the proverbial garden path to considering stability and construction, the impermanence of our foundations, and the complicated layers of new growth. Looking back at the Garden’s history has given us a new perspective that we’re excited to share. 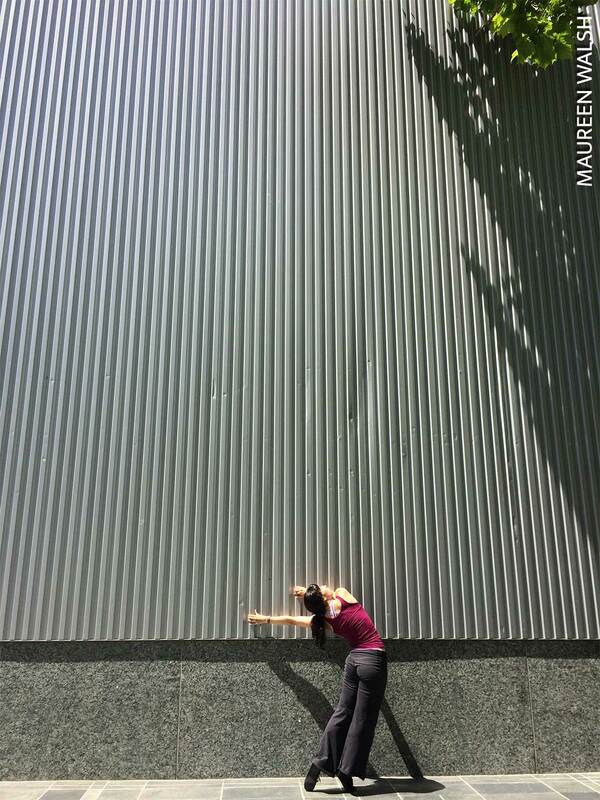 Click to see rehearsal video by Jennifer Norris of RAWdance’s Through my fingers to the deep. For more about RAWdance check out RAWdance’s website or Zaccho Studio’s An Interview with RAWdance.